Beneath our planet’s surface are fossils and remains that tell a story of Earth’s past – our ancestors, their lives and the climate that shaped their world. Dorothy and her science team play an important role in reconstructing the story by extracting plant and seed fossils and charcoal remains from lake and wetland sediments that hold clues about our past. Let’s take a closer look at how Dorothy investigates climate from thousands of years ago and the scientific tools of her trade. Find a good spot to study. The best places to find evidence of past climate are locations sensitive to climate change such as Ecotones. Here we often see a change from one type of vegetation to another or a boundary between different climate conditions. For example, Dorothy’s scientific field expeditions in New York’s Hudson River Valley take place at the boundary between freshwater and saltwater. Alaska is another favorite field site for her because here big differences in latitude produce dramatic landscape changes, creating a boundary transitioning from forest to tundra area. Build a great team. Dorothy often works with a diverse team, each person contributing his or her own expertise. These include other climate researchers, a glacial geologist, an archeologist, a biochemist, and computer climate modelers. She also involves people from various education levels, including high school and university students. Dorothy's team coring in a New York wetlandCourtesy Dorothy PeteetA significant amount of Dr. Peteet’s time is spent in the field on scientific expeditions, collecting climate proxy data in wetlands, forests, and tundra. 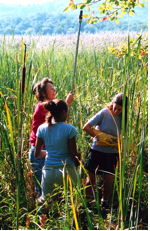 Field studies can last from just a day to several weeks. Some of her field studies take her into the Alaskan wilderness on Kodiak Island where she and her team are air dropped in by plane. They set up a field camp that serves as their home for the next few weeks while they venture into the surrounding wetlands and lakes to collect cores of sediment. Within these cores lie the fossils and remains to analyze for constructing thousand-year records of past vegetation and climate. Before collecting data, camp is set up with tents, food, emergency-channel 2-way radios, scientific instruments and tools, plant field guides, maps, and even gun in case they encounter a dangerous situation. Get out your tools. A long cylindrical section of Earth called a core is extracted from ice or sediment. Cores contain an abundance of information. The deeper the team drills down, the further back in time they can find fossils that tell us about what climate was like. In total, Dorothy has about 30 cores that cover about 15,000 years of Earth’s climate in North America. These cores are kept in long tubes stored in a large refrigerator at Lamont’s Core Repository. Sift, Identify, Burn, Weigh and Analyze. Pine pollen viewed under a microscope (left) and pine tree (right)Courtesy Dorothy PeteetBack at the New York lab, the team goes through a number of steps to interpret the field data they collect. A brass screen is used to sift through the sediment for plant macrofossils such as seeds and moss. A full 8 hours of processing 12 samples for pollen includes using strong chemicals to dissolve everything but pollen – sit, sand and organic matter – until a residue of isolated pollen is left in the test tube. Under a microscope we can see beautiful and diverse details for identification of pollen and seeds. This begins the process of understanding what plant life was present at different core depths, and what it means in terms of climate. Samples of carefully identified seeds and needles are sent to a lab in California, which specializes in determining just how old the cores are at each of their layers. Data is entered into a computer program used to construct a graph of the pollen record for the core time period and analysis of climate change begins. Dr. Peteet’s NASA summer institute high school students and teachers work with her to construct a carbon storage record from the core. First they dry and weigh sediment samples from the core. Next, they burn the samples, weighing them after the burn to see how much organic matter was present. The final step is to perform a mathematical calculation to determine how much carbon exists in the sample, using the weights before and after burning. Using climate models. Among the most important applications of Dorothy’s research is to inform and improve climate models or General Circulation Models (GCMs). GCMs are complex computer programs that simulate Earth’s climate through mathematical equations. One GISS climate modeler made improvements to the GCM by integrating Dorothy’s evidence that the Younger Dryas warming is found on Kodiak, Alaska, not just in and around the North Atlantic Ocean, as scientists previously thought. GCM model experiments were conducted to see how a cooler North Pacific Ocean might have influenced temperatures around the world during the time of the Younger Dryas. The results indicated that cooling the N. Pacific has an enormous effect on air temperatures because it is such a large ocean. It is findings like these that help inform today’s scientists and the public about how Earth responds to changes in climate patterns that we are witnessing today.